The impact of proper aspiration of nasal secretions during upper respiratory infection on the frequency and severity of symptoms of lower airways has never been investigated. The study was aimed at testing if cleaning the nasal cavities of children with recurrent wheezing using an automatic nasal aspirator improves the upper and lower respiratory symptoms during the cold season. Parents of wheezing children (age 3-72 mo.) answered questionnaires and learned using a nebulizer equipped (cases) or not equipped (controls) with an automatic nasal aspirator (DuoBaby, OMRON, Japan). During a 90-days monitoring period parents filled an electronic diary (BreathMonitor, TPS, Rome, Italy) on their child’s symptoms of the upper and lower airways. Eighty-nine/91 patients (43 cases, 46 controls) completed the study. Less days with upper (25.0% vs 46.4%, p = 0.004) or lower (21.8% vs 32.8%, p = 0.022) airways symptoms and less days with salbutamol inhalation (12.2% vs 16.9%, p < 0.001) were reported by cases than by controls. The episodes of upper respiratory symptoms were shorter [4.3 days (95%CI:3.8–4.9) vs 5.7 days (95%CI:5.0–6.4), p = 0.007] but not less frequent [2.3 (95%CI: 1.8–2.8) vs 2.6 (95%CI:2.2–3.0), p = 0.122] among cases than among controls. Similarly, the episodes of lower respiratory symptoms tended to be shorter [3.8 days, (95%CI: 3.4–4.2) vs 4.4 days, (95%CI: 4.4–6.0), p = 0.067] but not less frequent [1.9 (95%CI:1.5–2.3) vs 2.1 (95%CI:1.7–2.4), p = 0.240] among the group using the nasal aspirator. In our pilot study, the use of an automatic nasal aspirator in children with a history of recurrent wheezing was associated with an improved respiratory health during the cold season. Infections of the upper and lower airways as well as wheezing are the first causes of doctor’s consultation in the first 2 years of life. Their social and economic burden at a worldwide level is enormous [1, 2]. First-line treatment of airways infections is frequently based on local, rather than systemic drugs. Local treatments include corticosteroids and β2-agonists for the lower airways as well as corticosteroids, nasal anticholinergics and decongestants for the upper airways [3, 4]. Drugs can be administered with metered dose inhalers (MDI), nebulizers, or other devices [5, 6]. Young families, predominantly in the western societies and especially in their first born child, are not well trained to face the normal consequences of respiratory infections in their child . Thus, upper respiratory infections (URI) and lower respiratory infections (LRI) result often in unnecessary frequent doctor’s consultations, work days lost and over-treatment with antibiotics, etc. [7, 8]. Upper and lower respiratory infections often share etiologic and risk factors, they are pathophysiologically linked and appear frequently associated [9, 10], leading to the concept of “United Airway Disease” (UAD) [11–13]. Under the UAD concept, prompt and proper treatment of URI is considered beneficial to reduce the burden of LRI. In particular, maintaining the nasal cavity “free” from mucus (aspiration, lavage) is an additional advice given by most pediatricians to treat URIs. However, this advice is normally not heeded by parents and it is not known whether this intervention is able to improve the child’s respiratory health. The study was aimed at testing the working hypothesis that proper cleaning of the nasal cavities of children with recurrent wheezing, using an automatic nasal aspirator, improves the upper and lower respiratory symptoms and reduces the use of medication during the cold season. To this end, we monitored the daily symptoms and use of beta-2 adrenergic inhalation (salbutamol) of randomized pre-school children with a history of wheezing. During the 3 months monitoring period, patients included in the case group received a nebulizer equipped with an automatic nasal aspirator to use at their homes, while the control group received the same nebulizer without the nasal aspirator. The “Breathe-Free-Baby” study is a case-control study on the impact of device-assisted nasal aspiration on respiratory health. The study is structured in a time “0” (T0) visit, a monitoring period, and a time “1” (T1) visit. Children seeking care in the participating clinical centers for symptoms of the upper and/or lower airways between December 2016 and February 2017 were examined as candidates for enrolment. Criteria for eligibility were: 1) one or more episodes of doctor’s diagnosed wheezing and/or recurrent cough requiring salbutamol inhalation occurring in the last 12 months; 2) age between 3 and 72 months; 3) sufficient comprehension of the German language; 4) availability of a smart-phone and/or a personal computer with ADSL connection at home. Exclusion criteria were: 1) anatomic malformation causing chronic nasal and/or bronchial obstruction; 2) severe chronic disease; 3) contraindication for the use of beta sympathomimetic drugs; 4) intention to move away from Berlin during the monitoring period. Recruited patients were further randomized and allocated to one of the two groups: cases receiving the nebulizer with nasal aspirator and controls receiving the nebulizer without nasal aspirator. The study design included a first visit (T0), followed by a monitoring period and by a final visit (T1). During the first study visit (T0), the doctor informed the parents in detail about the study protocol and procedures. Parents answered a list of questions on sociodemographic information and symptoms. The study nurse instructed the parents about the set-up, use and cleaning of the nebulizer. Cases were also instructed to use the nasal aspirator. All parents were asked to test their capability to properly use the DuoBaby nebulizer for the inhalation of Salbutamol Ampoules in case of cough or wheezing and (cases only) its nasal aspirator in the office under the nurse’s supervision. Parents were asked to use the nasal aspirator with an “as needed” approach, i.e. in the presence of nasal symptoms (e.g. blocked nose, rhinorrhea, sneezing, etc.). Parents were instructed by the study nurse to properly check whether the nose cavities were free of mucus and when the use of the nasal aspirator had to start/finish. The mobile application (App) for the electronic diary “BreathMonitor” (TPS, Rome, Italy) was downloaded and installed on the parents’ smart phone. The App’s proper use was explained to the parents. The day-by-day data on symptoms and medication use, as well as data on the quality of life, were recorded via the electronic diary (e-Diary) (BreathMonitor®, TPS, Rome, Italy) by the patients’ parents during the monitoring period. Parents were asked to start filling the e-Diary on the day following the T0 visit (Additional file 1: Table S1). The monitoring period was of 90 days or more. The patients were able to consult the doctors and their co-workers as usual according to routine procedures. The “BreathMonitor” App included questions on upper and lower airways symptoms, their triggers and impact on daily life, as well as the use of daily medication. Hospitalization, doctor or nurse consultations were also registered. At the end of the monitoring period each child was examined again (T1 visit). The parents filled the three questionnaires on: A) symptoms and quality of life related to the child’s respiratory health in the monitoring period; B) use of the DuoBaby nebulizer unit (usability, acceptance, efficacy, etc.) (Additional file 1: Table S2); C) use of the DuoBaby nasal aspirator unit (only cases) (usability, acceptance, efficacy, etc.) (Additional file 1: Table S3). The “DuoBaby” nebulizer (OMRON Healthcare, Kyoto, Japan) has been thoroughly tested and certified by the European Community for its standard use in children (Additional file 1: Figure S1). The device is equipped with two different nebulization tops, of which one is specifically designed for treating the upper airways (MMAD approximately 9 um) and one for treating the lower airways (MMAD approximately 4 um). In addition, DuoBaby contains a nasal aspirator which, thanks to the venturi effect, creates a vacuum with a suction force between 0.15 and 0.2 bar. The produced suction allows mucus to be removed from the nasal cavities and is collected in a collection chamber. Randomization was performed by allocating each patient with a 1:1 ratio between treatment and control group according to a simple randomization list prepared by an external researcher using R statistical software (R Core Team, 2014), version 3.2.3. Each name of the allocation sequence was put in sequentially numbered, opaque, sealed envelopes and opened by the Doctor at the T0 visit only after the participant’s name was written on the appropriate envelope. The Doctor registered the allocation and then communicated it to the patient. The allocation group of each patient was blinded to the statistician who analyzed data. The study was aimed at testing the working hypothesis that regular and proper cleaning of the nasal cavities of children with recurrent wheezing, using an automatic nasal aspirator, improved the upper and lower respiratory symptoms. As secondary objectives the study tested if regular assisted aspiration improved aspects of the family’s quality of life linked to the child’s respiratory health and reduced the use of medication during the cold season. Moreover the degree of usability, acceptability and tolerability of the nebulizer (case and controls) and of the aspirator (cases) devices was tested. Mean frequency of doctor’s consultations and/or hospitalization due to wheezing and/or recurrent cough during the “cold” season (January–April) in the category of eligible children is in the study settings (offices of Dr. Pizzulli and colleagues) around 1.5 per month. This corresponds to 6 episodes in the observation period of four months (≈ 120 days). We considered clinically relevant at least a 12% reduction of this rate (i.e. from 6 to 5.3 episodes with a standard deviation equals to 1) in the group of children using DuoBaby nasal aspirator (cases). Considering an alpha error of 5% and a power of 90%, 43 subjects per each group were needed. Considering a 15% drop out 50 patients per group were recruited. Data were summarized as numbers (n) and frequencies (%) if they were categorical and as mean/median and standard deviation (SD)/interquartile range (IQR) if quantitative. Chi-squared test, when conditions were respected, or Fisher test was used to evaluate the association of categorical data between groups. Mann Whitney U test was used to compare quantitative not normally distributed variables between groups. To assess the normal distribution of quantitative data, the Shapiro–Wilk test was applied. The severity of respiratory symptoms during the monitoring period was calculated at individual level on the basis of the data collected with the e-Diary. At group level, for each parameter, the cumulative number of days with each symptom recorded by all the cases or controls was referred to the cumulative number of reported days by all the cases or controls, respectively. At individual level, for each parameter, the percentage of days with symptoms was referred to as the total of the recorded days by the patient. We defined an episode of upper or lower respiratory symptoms as the period of time (number of days) with symptoms between the last day without symptoms and the last recorded day with symptoms. Multilevel mixed-effects were applied to take into account repeated measures of the same patients for analysis on episode’s duration. A p-value < 0.05 was considered statistically significant. Statistical analyses were performed with R statistical software (R Core Team, 2014), version 3.2.3. Ninety-one patients with symptoms of the upper and/or lower airways met the inclusion criteria and were 1:1 randomly assigned to the cases group receiving the nebulizer with nasal aspirator (n = 45) or the controls receiving the nebulizer without nasal aspirator (n = 46). 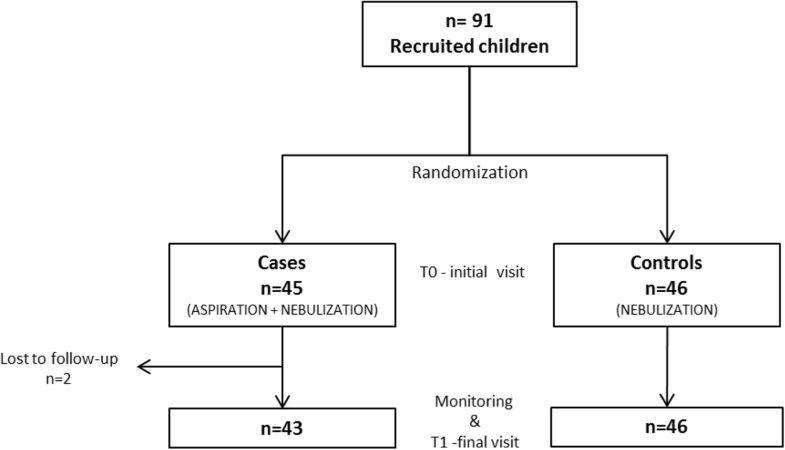 Two patients in the group receiving the nebulizer plus nasal aspirator did not complete the monitoring period and were excluded from the analyses (Fig. 1). Sixty one (69%) of the participants were male and their average (SD) age in months was 32.5 (20.5). The majority of them were Caucasians (76%) and mothers answered to the questionnaire more frequently (64%). No significant differences between the two study groups were observed in one or more events of cough outside cold and in the frequency of indirect markers of asthma severity: sleep disorders, emergency events, nights in the hospital and days missed at pre-school/daycare (Table 1). Over 90% of the participants in both groups considered of the DuoBaby nebulizer easy to use and clean (Table 2). Overall, 27 families initially had minor problems in implementing the nebulization, which were promptly solved by further consultation of the study nurse. Only 2 children did not tolerate the nebulization. The vast majority of the families reported an improvement of symptoms after the use of the nebulizer (80%, cases; 69%, controls), would use it again in the following winter season (70%, cases; 69%, controls) and would recommend the instrument to other families (77%, cases; 79%, controls) (Table 2). Most participants considered the “DuoBaby” nasal aspirator easy to assemble and clean (Table 3). The removal of nasal secretions by aspiration was considered very or partially successful by 19 and 54% of the families, respectively. Similarly, the nasal symptoms were considered greatly or partially improved after aspiration by 17 and 46% of the parents, respectively. A positive impact of the use of the nasal aspirator was observed by about 50% of the parents on sleep, eating, and overall wellness of their children (Table 3). These values did not change when only parents of children younger or older than 24 months were examined (not shown). The mean (95% CI) number of days monitored after the T0 visit was of 102 (90–113) and 111 (102–120) in cases and controls, respectively. 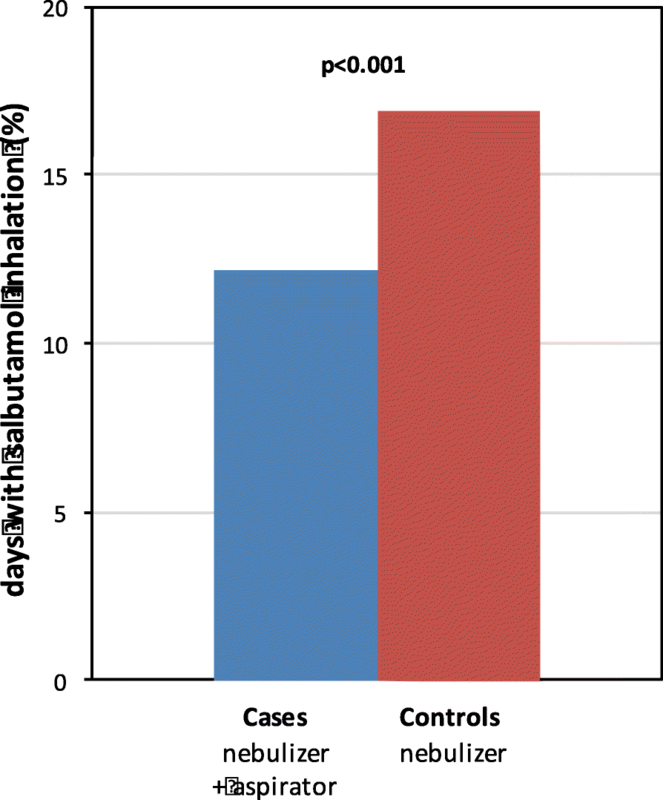 The patients using the nebulizer with nasal aspirator inhaled salbutamol less frequently than the patients using the nebulizer without nasal aspirator (12.2% vs 16.9% of the monitored days, p < 0.001) (Fig. 2). After stratification by age groups, this difference was observed only among the children older than 24 months (Additional file 1: Figure S2). 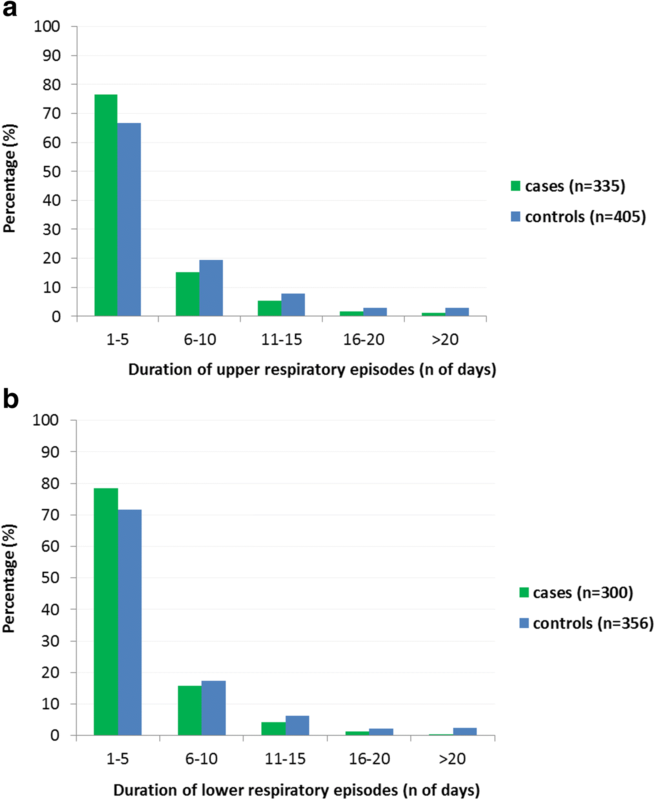 The average percentage of days with any upper (25.0% vs 46.4%, p = 0.004) and with any lower (21.8% vs 32.8%, p = 0.022) airways symptom were both significantly lower in the group using the nebulizer with the nasal aspirator than in the group using the nebulizer without nasal aspirator (Table 4). In particular, a statistical significance was reached in the proportion of days with runny nose. A reduced frequency of productive cough among the cases vs controls (14.7% vs 20.3%, p < 0.033) was observed while no differences between the two groups were observed in the analysis of the frequency of wheezing (Table 4). The most relevant associations remained significant after stratification of the sample according to the use of controller therapy (Inhaled Corticosteroid, ICS) (Table 5) By contrast, after stratification for age, the observed differences in upper and lower airways symptoms were stronger and significant among children older than 24 months only (Additional file 1: Table S4). No difference was observed in the average number of episodes per month of upper [2.3 (95%CI: 1.8–2.8) vs 2.6 (95% CI:2.2–3.0), p = 0.122] or of lower [1.9 (95% CI:1.5–2.3) vs 2.1 (95% CI:1.7–2.4), p = 0.240] respiratory symptoms in the groups using the nebulizer with or without nasal aspirator (Fig. 3). In contrast, the duration of the episodes of upper [4.3 days (95% CI: 3.8–4.9) vs 5.7 days (95% CI: 5.0–6.4), p = 0.007] and of lower [3.8 days, (95% CI: 3.4–4.2) vs 4.4 days, (95% CI: 4.4–6.0), p = 0.067] respiratory symptoms were significantly or marginally shorter, respectively, in cases compared to controls (Fig. 4). When the cumulative number of days with symptoms was compared between the two groups, the cases had not only less days with upper and lower airways symptoms, but also less days with throat soreness, earache, and sleep disorders (Additional file 1: Figure S3). We completed a case-control study of 89 wheezing pre-school children in Germany, monitored for over 3 months during the cold season. To treat their child’s respiratory symptoms at home, we provided all parents with the same nebulizer, either equipped (cases) or not equipped (controls) with an automatic nasal aspirator. We observed a significantly lower burden of upper respiratory symptoms and cough as well as a lower use of nebulized salbutamol in cases compared to controls. The results of our pilot study suggest that a regular aspiration of the nasal cavities with an automatic device improves respiratory symptoms in wheezing children. Our study shows an impact of nasal aspiration among both, children receiving or not receiving a regular controller therapy (inhaled corticosteroids, LTRA and/or nasal corticosteroids) on both, upper and lower airway symptoms: A) The episodes of upper airway symptoms were shorter but not less frequent among the cases than among controls. This observation suggests that the regular aspiration of the nose during colds may accelerate the resolution of a nasal viral infection but cannot prevent its recurrence. B) The reduced burden of cough suggests that a regular nasal aspiration during colds may prevent the post-nasal drip (the transition of nasal mucus in the pharynx), i.e. a well-known trigger of cough . The postnasal drip is likely to be the most important factor linking the nasal aspiration to an improvement of respiratory symptoms. A pharmacological treatment of upper airway inflammation may improve bronchial hyper-responsiveness and cough [15–19]. Our results suggest that - especially in children older than 24 months - even the simple mechanical removal of nasal mucus may improve symptoms of the lower airways and reduce the need of salbutamol. A strong relationship between the upper and lower airways has been repeatedly shown in the literature [20–22]. It is more difficult to explain why a reduced use of salbutamol among cases was not paralleled by a reduced frequency of wheezing or difficult breathing. We can only speculate that parents had difficulties in the recognition of wheezing, a problem that has been previously reported in many studies [14, 23, 24]. On the other hand, the reduced frequency of cough – an asthma-like symptom - may have induced the parents to administer less salbutamol to their children. Most parents perceived the handling, assembly and use of both, the nebulizer and the nasal aspirator unit of the DuoBaby device as easy and user friendly. Also the impact of the salbutamol inhalation was considered useful and highly effective on the symptoms of their child by most parents. About three quarters of the cases’ parents evaluated the removal of nasal secretion as totally or partially successful and about one third considered the use of the automatic nasal aspirator not beneficial for the respiratory symptoms of their children. This result is not surprising, given the wide age range and distribution of the study population, composed of infants, toddlers and pre-school children. The idea that cleaning the nose is essential for a better respiratory health in children is a widely accepted concept for more than a century in westernized countries. However, to our knowledge, our study is the first exploring in a systematic way the influence of nasal aspiration on the occurrence of symptoms of the upper and lower respiratory airways. In addition, ours is one of the first studies taking advantage of an electronic diary allowing easy monitoring of the patients’ symptoms and medication use at home during a long observational period. The high adherence to the BreathMonitor e-Diary compilation and the good acceptance of this diagnostic procedure will be thoroughly discussed elsewhere. However, we must acknowledge some limitations of our study design. First, the use of the nasal aspirator was prescribed “as needed”. Therefore, within the group of cases, the patients using more often the nasal aspirator were also those with more severe nasal and bronchial symptoms. This bias prevents the investigation of a causal-effect link between the use of the nasal aspirator and the reduced frequency of respiratory symptoms of cases, compared to controls. Second, the study population, powered to answer the principal research question, is not large enough to ascertain which subgroup of patients better responded during the monitoring to the use of the nasal aspirator. Third, due to the nature of the study, the control group was not treated with a “placebo”-aspirator; moreover, the data on primary outcomes during the monitoring period were self-reported. Thus we cannot exclude a “placebo” effect due to the availability of the aspirator. Our study is the first suggesting that aspiration of the nasal secretions with an automatic device improves respiratory symptoms in wheezing children during the cold season in a middle European country. The study also shows a wide acceptance and efficacy of a nebulizer combined with a nasal aspirator in early childhood. Further studies are needed to identify the phenotype of URI and LRI best profiting of a combined nasal aspiration plus nebulization intervention. The outcome of these future trials will also answer whether this novel approach deserves to be considered in guidelines for the treatment of respiratory diseases in childhood. The original version of this article was revised. Table 5 was typeset correctly. A correction to this article is available online at https://doi.org/10.1186/s13052-018-0518-5. We are indebted to Prof. Jürgen Schwarze for critically revising the manuscript. We acknowledge all the doctors and nurses in the three practices for their contribution and we thank all the families for their participation in the study. We thank also Mr. Charles Clawson for English editing. This study has been supported by an unrestricted grant from OMRON Healthcare. The Company had no role in the design, management, data collection, analysis or interpretation of the data or in the writing of the manuscript or the decision to submit for publication. The content of this paper reflects the personal opinion of the Authors and not of their Institutions. This article is written in a personal capacity and Dr. Matricardi’s authorship is independent of his affiliation with Charité Medical University. PMM conceived and designed the study and wrote the manuscript with input from AP, JF and SH; AP also conducted patient interviews and collected data with AB and HR; JF also helped in validating the app; ST worked out the platform details and IT related aspects; PW was the study nurse of the study; SP performed data management and statistical analysis of the study. All authors read and approved the final manuscript. The study protocol was approved by the Ethic Committee of the Medical Council in Berlin on November 7, 2016 (app. Number Eth-41/16). Parents or legal guardian provided written informed consent at the time of enrolment. Parents or legal guardian provided written informed consent at the time of enrolment for publication of any individual person’s data. Dr. Matricardi reports grants and personal fees from OMRON Healthcare. The authors declare that they have no competing interests. The International Union Against Tuberculosis and Lung Disease. Paris. France, editor. The Global Asthma Report. www.globalasthmanetwork.org. Accessed Nov 2017.